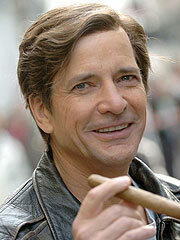 Q: What has Dirk Benedict, from the original “A-Team,” been doing lately? — Arlene in Rochester, N.Y.
A: Dirk, who also starred in the original “Battlestar Galactica,” has been embracing his sci-fi roots in recent years. He’s provided his vocal talents for a number of “Battlestar”-related videogames, attended numerous sci-fi conventions and co-starred in the original SyFy channel movie “Earthstorm.” Also, if you saw the 2010 big-screen version of “The A-Team,” then you know he made a cameo appearance, dispensing helpful tanning advice to the new “Face,” Bradley Cooper. Q: I just read that production on “Hell on Wheels” might be delayed due to flooding in Calgary, where the series is filmed. Do you have any info on that? — Windell S., Port Wentworth, Ga.
A: Production of the Western — which centers on the settlement that accompanied the building of the transcontinental railroad on 1865 — was delayed a bit as rising waters flooded the show’s set. Instead of season three premiering on AMC on Aug. 3, it has been pushed back to Saturday, Aug. 10. The two-hour season premiere begins at 9 p.m. ET/PT. A: I am sorry to have to tell you that the medical drama — which was based on the novel of the same name by CNN’s chief medical correspondent, journalist and neurosurgeon Sanjay Gupta — has been canceled after only one season on TNT. Even with the star power of Ving Rhames and Alfred Molina, it couldn’t survive its dismal ratings. One of my lucky readers will have a chance to win an autographed copy of this book, so you can fall in love for the first time all over again. Entering the contest is simple: Email me at letters@cindyelavsky.com and tell me which book(s) made you fall in love with reading. You can also send me a snail-mail letter — ATTN: Cindy Elavsky, KFWS, P.O. Box 536475, Orlando, FL 32853-6475. Entries must be received by Aug. 31.